An on-farm applied study of using “farmscaping” and beneficial planting principles on farms of all scale. The idea of growing a crop with the purpose of benefiting others is nothing new to agriculture. Cover cropping, nurse crops, and interactions between neighboring plants has long been used and studied as means to improve agricultural and natural interactions. In this on-farm study, diverse plots were planted in the marginal field areas that are either difficult to plant, poor yielding, subject to erosion, or otherwise neglected. Planting a mixture of warm-season plants is intended to provide: habitat for beneficial insects and wildlife, flowers for pollinators, biomass for soil structure, and weed suppression through good leaf canopy cover. This qualitative research of the planted biodiversity crops will consider the establishment techniques, species selection, timing, and benefits for agriculture systems of any scale. Buckwheat – Cool season and Summer annual that covers soil quickly and produces a flower in 70 days. For weed suppression, Phosphorus scavenging, nectar source, and soil erosion reduction due to fine fibrous roots. Sunflower– Native summer annual. Produces large amounts of biomass and provides pollen for bees. Semi-drought tolerant and quick growing. Sunflower also provides a large root mass that is beneficial in maintaining soil structure and reducing erosion effects. Research shows a reduction in corn borer, soybean cyst, and other crop pests with sunflower production in a crop rotation. Sunn Hemp -Sunn Hemp is a tall, herbaceous, warm-season, annual legume producing up to 120 lbs of Nitrogen and 5,000 lbs of dry matter per acre in just 9 to 12 weeks. Adapted to poor soils and has rapid growth (up to 9 ft). Potential to improve soil quality, reduce soil erosion, conserve soil moisture, suppress weeds and nematodes, recycle plant nutrients, as well as provide insectary habitat. Yellow Sweet Clover – Biennial forming large plants with lots of biomass (up to 8,500 lbs per acre in 2 years) and having a strong taproot that breaks up compacted soils. The flowers attract honeybees, tachnid flies, and large predatory wasps. This plant is highly adapted to drought and poor soil. Brown Top Millet- Annual, warm-season grass. Fast growing cover to suppress weeds, provide cover for wildlife and insects, reduce erosion, and prevent wind damage. Also known to suppress Root-knot Nematodes. Large seed production provides food for small wildlife. 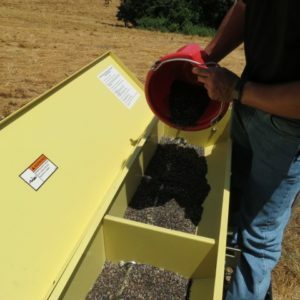 Filling seed mix in seed drill. Utilizing a 5-foot, no-till drill pulled by a minimum of a 50-60 horsepower tractor, the seed mix was planted at a rate of 38 pounds per acre. The drill was adjusted and calibrated to that rate and a planting depth of about 1.25″-1.5″. 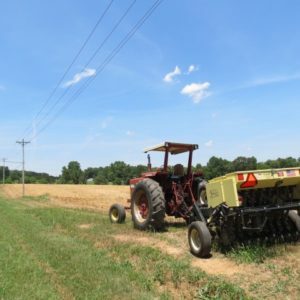 Tractor pulling no-till drill to plant between power poles and the road in a non-cultivated strip. The drill was followed and checked to ensure good seed placement and distribution. Each site was chosen based on the objectives of the producer. The sites all were typically uncultivated or marginally productive. Each site was observed weekly for 16 weeks for: germination, growth, flowering period, insect frequencies, and stand quality.